How Donald Trump Reportedly Inflated His Net Worth to LendersTrump often inflated his assets on paper, and once added ten floors to Trump Tower in a loan application. Could these actions constitute fraud? Report: Trump Repeatedly Inflated His Net Worth in Deals With Deutsche BankOver two decades, the bank reportedly lent Trump $2 billion. In response, Trump inflated his assets on three occasions and defaulted on major loans. Report: Mueller Subpoenas Deutsche Bank Records Relating to TrumpThis opens up a new phase of the investigation — and one the president definitely won’t like. Deutsche Bank Would Like Its Workers to Stop Being Filthy, Foul-Mouthed CretinsIn the office, at least. Deutsche Bank Hosted a Bikini Beach Party Last WeekendGroovy! After Three Years, U.S. Getting Around to Suing Some Banks [Updated]Bank of America, JPMorgan, Goldman, Deutsche, etc. The Black Eyed Peas Refused to Sing for Deutsche BankersThey would only lip-synch. How Being Too Big to Fail Created a Banking MenaceWho is “one of the most dangerous bankers in the world”? Big Banks Don’t Pay Like They Used ToUnless you include Bank of America. Banker Boot Camp Trains Wall Street’s Next GenerationAttendees at a “Training the Street” workshop race to complete spreadsheets and price Hermès. Banks Back in Control of the SituationFor the financial industry, things are finally starting to get back to normal. ‘Killer Karofsky’ Used ‘Magnetic Personality’ to Seduce Co-worker’s WifeAwkward. Deutsche Bank Is New Haven’s ‘Foreclosure King’The German bank is deeply involved in the housing-market crisis. Greg Lippman Has Named His New Hedge FundThe Deutsche Bank CDO manufacturer is free, and it’s the greatest. Senate to Probe Goldman, DeutscheThey’re looking for e-mail records about mortgage-backed securities. Boaz Weinstein Proves Failure Is an OptionThe credit trader, who lost $1 billion last year, will move seamlessly into a new job. Now We’ll Get to See Even More of the Naked CowboyThe scourge of Times Square is getting his own reality-TV show. Meanwhile, a Cadwalader partner sues over the mold in his Hamptons house, and the ‘Times’ thinks we care too much about people’s personal lives (can’t imagine why), and more, in our daily roundup of industry news. Stevie Cohen Could End Up in a PickleNo, not in the Damian Hirst sense, though that would be amazing: The art-loving SAC Capital Management CEO could have some problems with the SEC if he’s not careful. Plus! An ex–Bear CEO jumps ship at JPMorgan, Natalie Portman’s apartment goes on the block, and Condé Nast has a green issue, in our daily rundown of industry news. Harry Macklowe Takes It on the Chin Just about a year ago, real-estate mogul Harry Macklowe borrowed $5.8 billion from Deutsche Bank to buy seven office buildings in New York City while putting up just $50 million of his own cash. That debt would have come due today, but last week Macklowe made a tentative agreement to turn control of the buildings back over to the bank, since the current credit crunch has made it impossible for him to refinance the debt. Though some holders of the debt are reluctant to sign on to the plan, according to The Wall Street Journal, the deal will probably go through by the end of the day. Meanwhile, Macklowe is pleading with another lender whose bill came due today — Fortress Investment Group, from whom he borrowed $1.4 billion in 2003 — to give him additional time. To pay them off, he’ll have to sell off two other buildings he owns: a small midtown office building and the celebrated General Motors Building, bringing the total number of buildings he lost to nine. If the deal with Deutsche Bank goes through, could this be the first multi-billion-dollar real-estate deal gone sour in which unsuspecting investors aren’t given the shaft — in the form of multi-billion-dollar write-downs or plummeting stock prices — and the responsible parties are the only ones to take it on the chin? Deutsche Bank Tries to Rescue Its Good NameEver wonder what Deutsche Bank thinks about all of this anger over the deaths of firemen in the Deutsche Bank building? You know, because every news story refers to the dangerous hollowed-out edifice as “The Deutsche Bank Building” even though Deutsche Bank sold it in 2004? Well, guess what — Deutsche Bank hates it. We hear they’ve had publicists scrambling to contact news agencies who are covering the story and get them to refer to the building as 130 Liberty Street, or at least “the former Deutsche Bank building,” so that Deutsche Bank won’t keep being associated with the accidents there. One such journalist pointed out “that the name Deutsche Bank was like the Chrysler Building — no one cares if Chrysler is still in the building, it’s still called that.” Though, the Chrysler Building didn’t kill anybody lately. We sort of see Deutsche Bank’s point. Are You Smarter Than a Goldman Banker?Great triumph mixed with crushing defeat the other night as highly competitive people with lots of disposable income gathered at the Gramercy Park Hotel Private Roof Club for a fancy quiz night to benefit Darna, an organization that feeds struggling women and children in Tangier. It was a strange mix of monied New York: socialites, models, fashion designers, and, of course, investment bankers, who felt a little out of place. “We’re investment-bank nerds, so we spent pretty much a month planning our outfits,” said a member of the Goldman Sachs team. “We had wardrobe consultations on conference calls.” The grand prize they were competing for? A trip to Morocco to stay in the family villa of model Jacquetta Wheeler, the host. A Bad Day for Daniel Goldstein* • The key lawsuit seeking to block Atlantic Yards has been dismissed on a technicality. A group of tenants facing eminent-domain relocation failed to convince a judge they weren’t offered comparable housing. 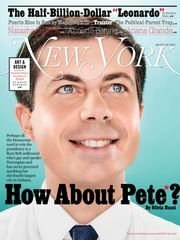 [NYP] • Mark Green, the new president and one of the marquee voices of Air America, interviewed Michael Bloomberg for the network’s big relaunch next week; the ex-rivals were reportedly quite chummy, trading bad puns and agreeing on most of Bloomberg’s mayoral policies. [NYT] • This is exactly what the torturously slow dismantling of the Deutsche Bank building was supposed to prevent: A fifteen-foot-long pipe fell 35 stories from the half-stripped skyscraper, plunging into a neighboring firehouse and sending two firefighters to the hospital. [NYDN] • Bail for the domestic-enslaving Long Island couple was set at $2.5 million for the wife and $1 million for the husband; meanwhile, a raid on the mansion is said to have uncovered the instruments of torture, which include knives and a rolling pin. [Newsday] • And, a bomb scare shook up an elementary school in the Putnam County town of Kent after a suspicious and fragrant package was delivered to the building. But not to fear: After a Hazmat team and bomb squad got involved, an X-ray revealed it was twelve pounds of marijuana. [WNBC] * Or maybe not a bad day at all. As explained here, we totally misread this news.